Slime. No,Not that "Slime" from the 80's Ghostbuster series but instead "Adult Slime" by Mega house (20 USD). So if up for a slime prime time, feel free to airborne here. 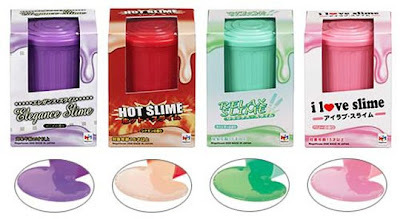 "Adult Slime comes in four varieties: hot, relax, love, and elegance that are colored and scented to match the ascribed mood. It even comes in a plastic garbage can capsule" In order word, you can play with it and get floored by its relaxing aroma! sorry silap for the earlier comment. I type again. YES, ALL HAIL TO THE POWER OF THE SLIME!!!! !